Rip-roaring, roister-doistering and with such a deliciously dark blood-red vein of tense narrative running through it, Prentice and Weil's "Black Arts" is the sort of darkly delicious novel I just cannot resist. 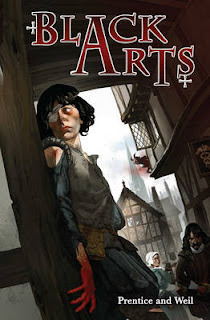 Set in the stinking decrepit streets of Elizabethan London, "Black Arts" introduces us to a young street-thief named Jack who is about to undertake his first step on the 'career ladder' with notorious underworld crime king Mr Sharkwell. But Jack's light fingers get him into more trouble than he bargained for when he steals a mysterious pouch containing seemingly innocent items. One of the items, a clay pipe, completely transforms Jack's life, bringing personal tragedy and dark magic hand in hand to land smack bang on his doorstep. Fuelled by revenge, and the thirst for knowledge as to what his blood-red arm and mysteriously disrupted visual senses mean, Jack finds that his new talents are of particular interest to both sides of an unseen and wholly world-shattering conflict raging as London sinks further and further into moral degradation. Jack is an interesting character, at first damaged and fragile but given new courage by vengeance and his first faltering dalliances into what his new powers can accomplish. With the aid of Sharkwell's own grandaughter, and other sympathetic characters, Jack soon finds that the mysterious and powerful enemy he makes early on in the story is perhaps an unbeatable foe. Or is he? "Black Arts" happens at such a pace that you barely have time to draw breath. At times, Jack is seemingly lost in the morass as he struggles to make sense of his powers, and who can truly be trusted to help him exact revenge. With luscious descriptive landscapes of rotten London painted in broad bloody strokes, and a strong and memorable cast of characters stretching as high as the Queen's own trusted advisers, this is a novel that is wrought from the darkest hues, but doesn't shy away from providing moments of comedic relief when things get too intense. One for the blackest nights when you crave a page turner that will haunt you even as you dance between the waking world and your own darkly delicious nightmares.